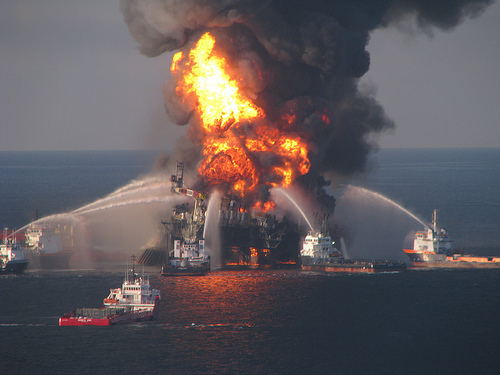 BP are now caught in the middle of the worst possible scenario – one of the company’s oil drilling rigs in the Gulf of Mexico exploded on April 22 and sunk, resulting in a major environmental disaster as more than 5,000 barrels of oil leak into the ocean per day. 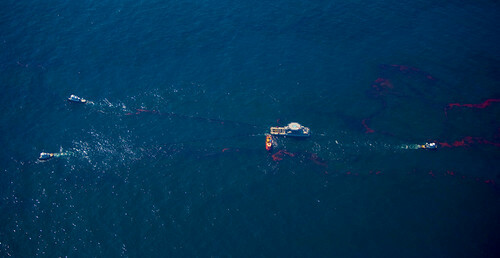 The long term reputation of the company is at stake because of the accident, that in many instances has been labelled “the BP oil spill”. On the EPA site, for example, it is called “the British Petroleum Oil Spill” and even the link to the site is http://www.epa.gov/bpspill/. As the Star Phoenix notes, “in PR circles, if a disaster gets named after your company, this is a bad thing”. This is obviously a horrible situation, on so many levels, and I don’t envy the people at BP that have to handle communication during this tough time. And nowadays, crisis management has extended into social media and it is a parameter a company need to integrate into its communication strategy. As one would expect, BP is taking a severe beating in social media right now, when consumers vent their frustration with the effects of the disaster. On Twitter, thousands of tweets are currently being published mentioning BP in connection with the oil spill. 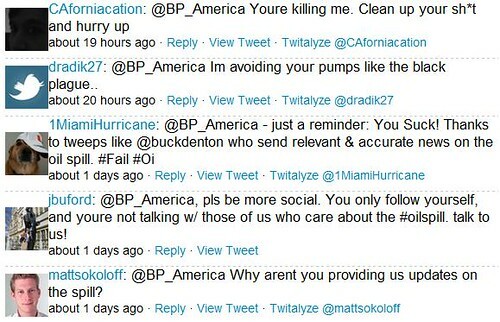 Many of them are also directly addressing BP’s US corporate Twitter account with angry comments, suggestions and questions. However, BP are not responding to any of those comments. In fact, the company does not communicate much at all via @BP_America. The account does not respond, retweet or follow anyone else on Twitter (see Klout score below), making it a pure one way communication channel. On top of that, the few tweets that are being published are press releases syndicated to Twitter via Twitterfeed. Nothing wrong with that, but if you publish press releases on your site in capital letters, it doesn’t land well on Twitter, where it equals SHOUTING! I don’t want to point fingers at BP for not using Twitter to its fullest potential in this difficult position. Instead, why not point to other stakeholders in this catastrophe that are doing things well? For example, the US Coast Guard has a Flickr account where it publishes photos and images under Creative Commons license. Images are displayed on http://www.deepwaterhorizonresponse.com/ as a slide show. In the menu of the site, there is even a section for “Social Media” which points to the U.S. Coast Guard’s presence on Facebook, Twitter and Flickr. Update: I forgot to mention that this site is being maintained by British Petroleum, Transocean, the U.S. Coast Guard, the National Atmospheric and Oceanic Administration, the U.S. Department of Homeland Security and the U.S. Department of Department. The US Environmental Protection Agency, EPA, also uses social media. Administrator Lisa Jackson responds on Facebook and Twitter. I’m sure there are many more examples. The problem for a company in a crisis, especially when you are already in the “bad guy” position, is that when you leave an entire arena to your opponents, the damage to your brand in the long run may be worse than it would have to be. Facebook has more than 400 million members and that’s a big channel to leave unattended. If you do a search for “BP oil”, the first hit you get is the group Boycott BP Oil. As a contrast, the BP America Facebook page has not been updated since Feb 18, 2010. In other words, there is room for improvement. The photo sharing site Flickr today reached 4 billion photos. The growth continues to be steady and over the last 2.5 years the site has grown with half a billion new photos every six months. Photo number 4,000,000,000 can be viewed here. Tags: flickr, photos, foto, flickr. Ping. The popular photo sharing site Flickr today reached 3.5 billion hosted photos. The growth has been steady the last 2 years with almost exactly half a billion new photos added to the site every six months. Photo number 3,500,000,000 can be viewed here. My previous post about Flickr reaching 3 billion, 2.5 billion and 2 billion. Tags: social media, flickr, photo, flickr, foto. Ping. The popular photo sharing site Flickr reached 3 billion hosted photos this afternoon (at about 6 PM CET), at least if the numbering of the photos accurately reflect the actual amount of photos on the site. The growth has been steady during the last 12 months. It took six months between 2 billion and 2.5 billion, and then another six months to reach 3 billion photos. Photo number 3,000,000,000 can be found here. 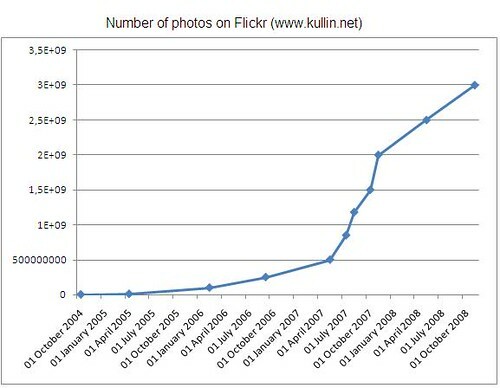 Previous posts about the growth of Flickr: 2.5 billion and 2 billion. Tags: flickr, flickr, foto, bilder. Ping. How do you police a site consisting of close to 3 billion pieces of consumer genererated media? Ask Heather Champ, Director of Community at photo sharing site Flickr, who oversees that the 30 million members of Flickr follow the community guidelines and don’t post pictures that the company consider illegal or inappropriate. Champ says there is a clear need to have a control function to monitor the site. “People become disassociated from one another online. The computer somehow nullifies the social contract,” she says. Read the entire interview by the San Fransicso Chronicle. Tags: flickr, ugc, photo, foto, flickr. Ping. The photo sharing site Flickr launched in February 2004. Yesterday the 2 billionth photo was uploaded to the site. The first billion took about 3 and a half years. The second billion took about three months. Now that’s consumer generated growth! I made the following chart based on when certain photos were uploaded to the site and double checked with my own photos to see that the dates matched reasonably.